Washington, Jan 11: US President Donald Trump has said that he saw "a lot of good energy" from the inter-Korean talks that happened for the first time ever on Tuesday after a gap of two years. "A lot of good talks are going on right now, a lot of good energy. I see a lot of good energy. I like it very much what I am seeing," Trump told reporters at the White House on Wednesday. He was addressing a joint press conference with visiting Norwegian Prime Minister Erna Solberg, when he was asked about the "historic" Korean talks, Xinhua news agency reported. "Hopefully a lot of good things are going to work out," he added. Trump's remarks have shelved his often-bellicose rhetoric on Kim Jong-un, North Korea's top leader. Since Trump took office in January 2017, his administration has resorted to hawkish and threatening rhetoric against Kim's regime, sent warships and conducted joint military drills with South Korea. Such moves, plus North Korea's several missile and nuclear tests, have sent the situation on the Korean Peninsula to a simmering extent. Trump softened his stance over the peninsula security situation on Saturday, saying he was willing to talk with Kim and support the talks between the two Koreas. However, he added that any talks will come with prerequisites. 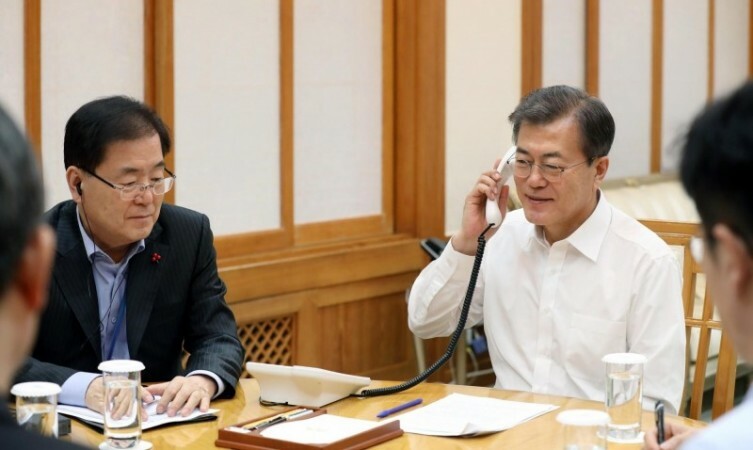 According to a White House statement, Trump, in a phone call on Wednesday with his South Korean counterpart Moon Jae-in, said he would be open to talks "at the appropriate time and under the right circumstances". The North and South Korea started high-level talks on Tuesday at the truce village of Panmunjom that straddles the heavily guarded border between the two neighbours. A joint press release issued after the dialogue said the North had agreed to send a delegation to the 2018 Winter Olympics to kick off in February in South Korea's Pyeongchang, and the 2018 Paralympics in March. Seoul and Pyongyang have also agreed to hold a separate dialogue between their military authorities to ease tensions and create a peaceful environment on the Korean Peninsula. Pyongyang on Thursday asked Seoul to abandon its military manoeuvers with the US, saying that the exercises were fuelling tension on the peninsula and increasing the risk of war.